Crash ratings should be one of the key points you consider when purchasing a new car. Unfortunately, many of the midsize luxury cars, including the Mercedes-Benz C-Class, didn’t do so well in the new frontal crash test that was developed by the Insurance Institute for Highway Safety (IIHS). According to the Richmond Times-Dispatch, the crash test has been developed to see what happens when a car hits another car or a fixed object. The test hits about a quarter of the vehicle’s front end by running it into a 5-foot rigid barrier at 40 miles per hour. The results do not bode well for non-luxury models either. They’re up next for the new test. These kind of tests and the results that they produce are highly beneficial to car manufacturers as they’re oftentimes used to make changes in vehicles’ designs and their safety features. And of course to advertise their safety and success. Our Boston car accident lawyers understand how crucial these test results are for those who are looking into buying a new car. 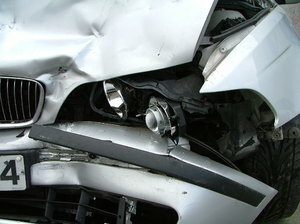 The result of this test and various other tests can be found on the Insurance Institute for Highway Safety‘s website. Before setting out to get a new car, you’re going to want to know about its crashworthiness, meaning you want to know how well it’s going to be able to protect you in the event of an accident. Officials with the IIHS rate these cars with the various ratings, including good, acceptable, marginal or poor. They test how vehicles handle in a rollover test, high-speed front and side crash tests as well as evaluations of seat/head restraints for protection against neck injuries in rear impacts. Manufacturers will have to return to the drawing board to find ways to correct the flaws and make the cars safer and more appealing to consumers. In the most recent test, officials looked at 11 cars. Of these cars, only the Infiniti G, the Volvo S60 and the Acura were marked with good or acceptable ratings. Many other vehicles, including the Volkswagen CC, the Lincoln MKZ, the BWM 3 Series and the Acura TSX came through with only marginal ratings. Among the vehicles with poor ratings were the Lexus ES 350, the Audi A4, the Lexus IS 250 and the Mercedes C-Class. Officials say that the results of this new test show that these vehicles’ side airbags are OK for T-bone accidents, but not for off-center ones. They say there’s a chance the bag won’t go off until it’s too late. In three of the cars, including the Volkswagen, the Mercedes and the BMW, the seat belts spooled out too much slack after an accident. The dummies in the vehicle were tossed around the cars because of it. The door of the Volkswagen was sheared off during the test. “With this new test, the institute has raised the bar again and we will respond to this challenge as we design new vehicles,” said officials with Toyota. If you have been injured in an accident, contact Law Offices of Jeffrey S. Glassman for a free and confidential consultation to discuss your rights. Call 1-877-617-5333.